I have studied '13-'14 Hubcaps for years, noting what is on original cars. The '13s are all by themselves, whereas the '14 style appears to have been used as late as 1917, but with nickel plating. 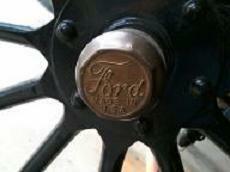 Note the 1913 hubcap has a much larger Ford script, and the "F" is much different. There are two hubcaps that Bruce photographed years ago on Pg. 159 in The Car That Changed The World. Is there supposed to be a black painted background? The background should be raven finished. The one on the left is typical for 1913 - 16 I think. I've seen that term, "Raven finish" several times, is that another word for Parkerizing? As I mentioned Royce, the hubcap on the left is 1913 only. That is the reason I posted this! I've got many of them - they seem too common to be 1913 only. Can someone answer the question about what "raven finish" and "Parkerizing" are? Thanks. Is it possible that these parts were made by different fabricators like many other "T" parts. Many casting have different marks and dipps however are used for the same purpose because they were made in a different foundry. There was three or four different body suppliers and therefore many little differences. At one time you had to specify the body manufacturer for replacement body parts. 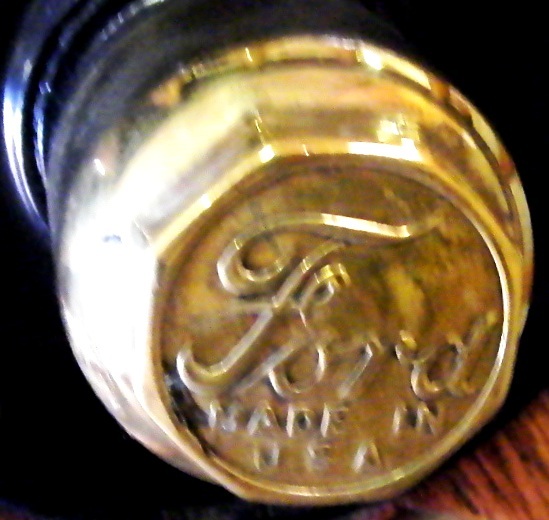 Raven Finish was Ford's term for a black oxide similar to Parkerizing, ebonol, and the like. Some were/are a hot process and others cold. 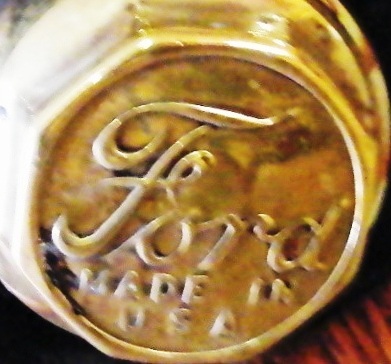 I don't think that the exact process used has been discovered in any Ford documents, but surviving examples bearing Raven Finish seem quite similar to these other finishes. The Eastwood Company sells a "metal blackening system" that puts a black oxide coating on steel parts. In my experience, the parts look good right after the treatment, but begin to rust again after about a year. I don't know how that compares with the durability of the original "raven" finish. I've taken some Ford tools and other small parts to a local gunsmith and had them blued. They came out very nice (black). I've heard over the years that they made a (high F ) and a (low F) script if I remember correctly the "high F" is earlier than the "low F" you'll also see the same thing in running board script as well. Steve, you are catching on to what I'm trying to get across, but the actual height of the "F" on the two examples I provided are pretty much the same. As you can see, the '14 and later script is not as big as the '13 type. Moving on to running boards, that is the one that really gets me. The vendors say '13-'25 are the same, but they are certainly not. The script is different, and the runningboard to fender bolt holes are different sizes too. Oh well, some folks don't seem to want to know, and that is why I posted this thread! If I remember correctly, I thought in McCauley's book, he said the 1914 hubcaps were not painted? Black background on hubcaps through at least 1921. This is a 1914 model year chassis. If it makes any particular difference, I noticed in the pic of the two on the red background, the left cap has a longer "left arm" to the middle line of the "F", and no "dots" between U S A like the one to its right. I'm assuming the one on the left is the '13? The ones on my '13 look like the one on the left in Larry's picture. It has an engine date of December 1912. In addition to what Tim posted, the top horizontal line is longer and thinner on the earlier '13 style when compared to the picture Royce posted of the hubcap on his '15. 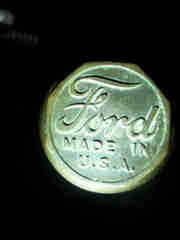 I have a NOS nickel plated hub cap, which I believe to be a 1917. The black background has flaked off in one place, and in that area it is brass, indicating that the black was put on before the nickel plating! Larry's hubcap is the same as my picture except his appears to have been flattened out somewhat from polishing. I was wondering Royce, how many of those hubcaps can you send to me? I'll give you a fair price! Well they have all made it on cars including Constantine's 13. I don't feel like replacing the ones on my '14 and '15 with reproductions Larry! I like the original stuff better than a repro even if the original has some history marks. 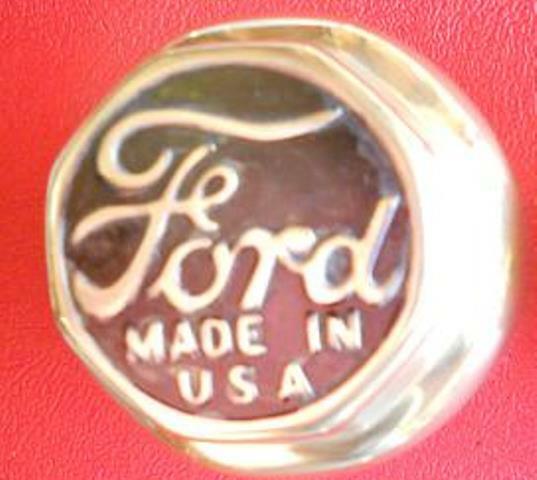 Did Ford produce hubcaps or were they jobed out? Bud. Royce, those hubcap scripts are different. Especially the r.
Thank you all (especially Larry S) for this thread. I may never get any of my cars really correct, but I am always working to get them closer. Threads like this one help out a lot! It is already bookmarked for future reference. About running boards. I have always believed the '13 to '16ish were slightly different. The angle of the cut varies at the front of the running board by the front fender. Some are near 45 degrees. Some are lower (flatter?) than that. Would that have to do with the angle of the earlier vs later fenders or just inconsistencies of the manufacturer? I did have some with smaller bolt holes. I think they ended up on the '14 I had some years ago because I cannot find them anymore. 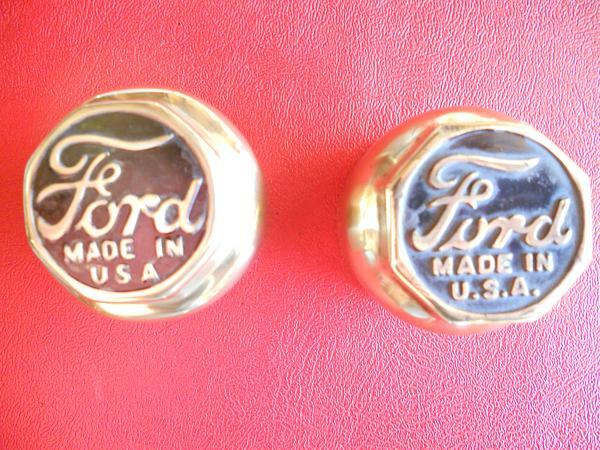 These are the front and back hub caps on my 1914 T Runabout. 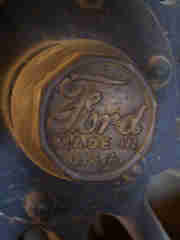 It was made 12/16/1913 #395707, It is an original car me being the 4th documented owner since 1914. It seems it has both styles on it. We all know Ford always used everything up. I recently got two of the '13 style hubcaps off of a '14. I traded him 2 for 1. I'm happy, and he is happy. 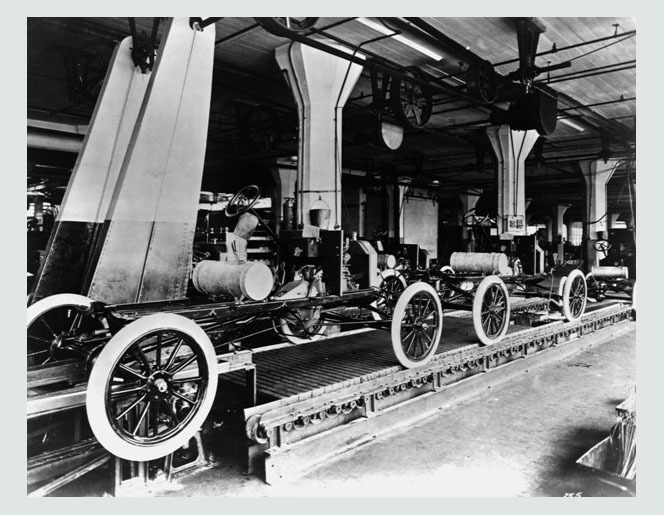 The diamond pattern on 1913 - perhaps 1917 running boards is different than later ones. These boards have the diamond pattern arranged to clear the area where the holes for the gas generator mounting bolts punch through. Yesterday, I was shineing brass, and one of my hubcaps didn't have the black background as it should. I didn't want to wait all day to get this done, so I found a spray can of Rustoleum Professional gloss black spray paint, that dries in 15 minutes. I waited about a half hour, and scuffed off the black paint off the letters with an old worn out piece of 400 grit wet or dry. Then, I did the tops of the letters with some brass polish, and it came out nice. Now, I have four almost matched hubcaps on my '13 roadster. Why almost matched? Well, even as the later hubcaps vary, so do '13s. The raised octagon on one of them is about 1/16" deeper that the other three. You are correct on size, they should be called skinny F and fat F, the fitment of the letter is in the same space on the cap so the have to be close to the same size in height. My bro-n-law and I was building a very early 1915 touring 11-12 years ago when we got into all the political correctness of what was early and what was late through each production run 1915-16 we had 4 rivet fenders for front, and collected every thing high F we could find in the way of hub caps, running boards ect... As well as electric fork mount E&J 1156 head lights these were marked on the buckets as was the brass rims. Then you get into louvered hoods or non louvered, correct horns bulb type or mag, horn. If it's bulb you need a 90 degree elbow that's impossible to find. All I know this takes tons of research and countless hours of your time, I've sense moved on I've built 2 1/2 cars in less time than it took us to find the right parts to build an early 15 project, that he and I spent a lot of years on collecting all the right parts for, it was fun and I love the hunt but it's very hard to ever build a 100 % correct car unless you find one in a time capsule somewhere. Even when you think you have everything correct someone will walk up and point some part or something they say isn't right, then it just ticks you off ! I prefer a fun car over a correct car myself. Too much stress ! For a great hobby. I built up a 1925 Runabout Pickup for a retirement project. It is one of the most rewarding experiences I've ever had, and because T parts are easy to find, I was able to use all original Ford parts. It was a challenge to get everything correct, but well worth it. I've still got a lot to learn as far as upholstery goes, but everyone that has seen it says it's ok. I've got another one out back if I ever run out of things to do. Oh, and since this is a hub cap thread, it has 4 NOS hubcaps on it. On the cap you spoke of, where the black paint flaked off to show brass underneath, (versus nickel plate), could it be that the black "peeled" off because the nickel plating under it peeled? Kind of hard to believe they would black coat the background prior to nickel plate. The black would act as masking, preventing the nickel from adhering. I'm going to go along with RV. I don't think there is any nickel under that black paint, and I'm not going to try to remove any more of it to find out either. I also have a NOS '17 or later cap that is totally nickel plated, and is identical to the one I posted on the right.